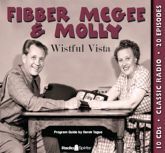 Jim & Marian Jordan star as Fibber and Molly McGee, holding down the homefront in these war year episodes. Fighting the battle of Wistful Vista involves volunteering for the Red Cross, dealing with shortages, contributing to scrap metal and War Bond drives, and sending letters by V-Mail...plus keeping an eye out for spies and an ear out for patriotic songs performed by The King's Men. Determined to do their part, the McGee's even take in munitions factory worker Alice Darling, played by Shirley Mitchell, as a boarder. Housekeeper Beulah, played by Marlin Hurt, is always on hand, along with regular supporting cast members Gale and Virginia Gordon, Bill Thompson, Arthur Q. Bryan, Ransom Sherman, Isabel Randolph, and announcer Harlow Wilcox. Includes 20 digitally restored and remastered episodes, and a Program Guide by Derek Tague.